Origin: China from the provinces of Guangxi, Guizhou, Hebei, Henan, Hubei, Shaanxi, and Yunnan. USDA 5-10 (zone 10 might not give enough cold each winter to induce dormancy followed by intense spring flower display). Landscape Use: Large scale trellis, wall covering, tree and building climber, green walls, landscape fragrance, southern antebellum motif. Form & Character: Graceful, lazy, engaging, old fashioned. Growth Habit: This is a perennial woody, winter deciduous vine of great vigor to 100 feet that can also spread by underground rhizomes. Foliage/Texture: Alternate, pinnately compound foliage 12 inches long, 7 to 13 leaflets (usually 11), ovate to lanceolate; medium texture. Flowers & Fruits: Elongated racemes of white, blue or violet flowers that are intensely fragrant smelling like grape bubblegum. The flowers on each raceme open simultaneously immediately before the early spring foliage has expanded. The fruit are a flat, knobby brown pod, sometimes pubescent with a velvet like feel, 2 to 4 inches long. Seeds are thick and disk-like. The fruit pods mature in summer and crack and twist open to release the seeds. The empty pods are persistent through winter. Seasonal Color: Chinese wisteria flowers give an intense color display in the landscape over a period of a week sometime during February or March. Temperature: Chinese wisteria plants are highly cold tolerant, but are also acutely sensitive to temperatures above 110oF. Light: In central Arizona landscapes, no western exposures, north and east exposures best; elsewhere geographically full sun. 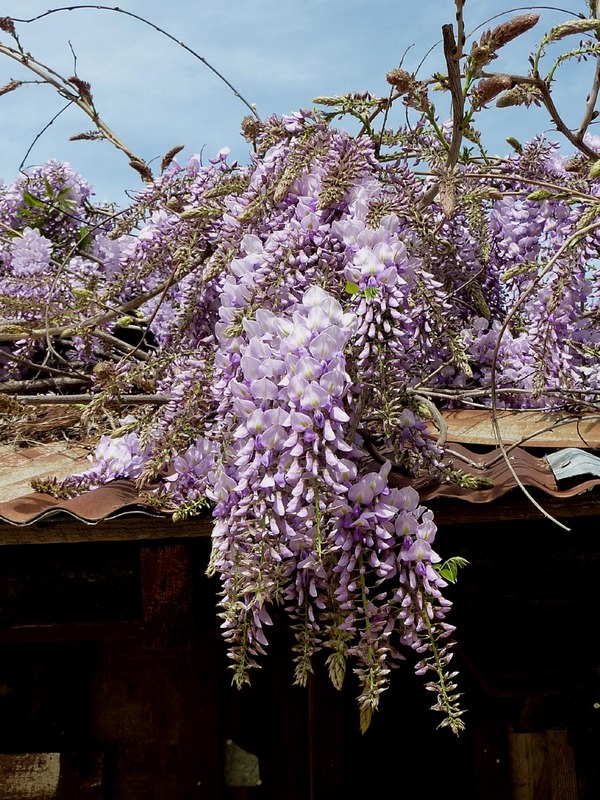 Soil: Chinese wisteria is tolerant of most soils conditions, as long as it doesn't get desert dry. Watering: Regular watering regimen in the desert is required. Pruning: Because Chinese wisteria blooms on wood produced the previous year, head back hard as needed in late spring after bloom. Comments: Chinese wisteria with its wonderful flower frangrance has a somewhat limited use potential in Phoenix because of its acute sensitivity to the intense desert heat and sun. In other areas of the southwest such as in California west of the Sierra Nevada mountains, this vine grows remarkably well. Chinese wisteria was first introduced to North American as a cultivated plant in the eastern United States in the early 19th century. 'Alba' has white flowers. 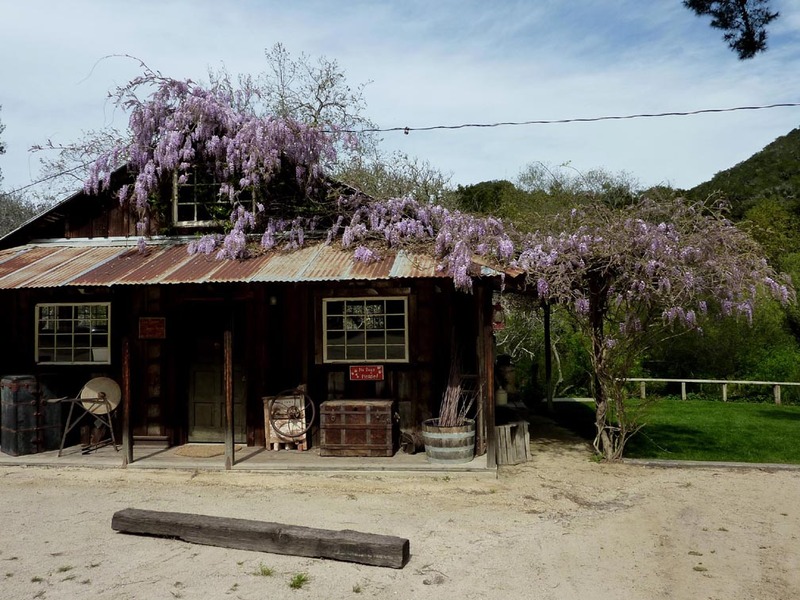 All parts of the Chinese wisteria plant contain a glycoside called wisterin that is toxic if ingested causing nausea, vomiting, stomach pains, and diarrhea. Blooming Wisteria and a bucket of KFC and I feel like I'm back in Waverly, Alabama.